The process begins in the studio where the artist skillfully creates an original design, usually in modeling clay. The completed clay sculpture is then brought to the foundry where a latex or fiberglass mold is created around it. After the mold dries the clay is removed, leaving an exact negative of the clay model. Once dry, the investment is placed in a kiln and the wax is melted out, hence the term “lost wax process.” The investment now becomes the mold in which molten bronze is poured. Once the bronze cools, the plaster-like shell is carefully broken away and the bronze casting is sandblasted to remove any trace of the investment. If the sculpture was cut into pieces prior to casting, which is common for large or complex bronzes, the pieces are now welded together. Many artists use traditional patinas created by applying acids and rubbing with steel wool. Some artists prefer to color their creations by heating the bronze with a propane torch and applying various metal oxides. Finally the bronze is waxed and buffed, and a wooden, stone, or bronze base is created for it. 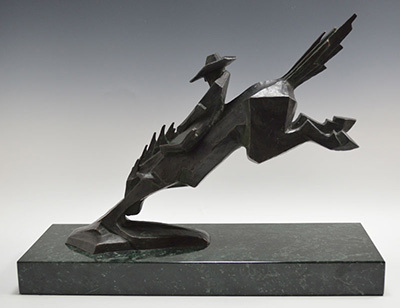 Although the lost wax casting method may seem straightforward, the creation of bronze sculpture requires constant interaction between the artist and many other highly skilled craftsmen. It takes many months–sometimes years–from conception to completion to create these original artworks. Understanding the process of creation adds to the appreciation of these beautiful works of art and the passion with which they are pursued by private, corporate and museum collectors. This article was excerpted from Canyon Road Arts: The Complete Visitors Guide to Arts, Dining and Santa Fe Lifestyle, Vol 1, 2005-2006, page 88. Canyon Road Arts is published by Medicine Man Gallery. All rights reserved.